'''Church website''': [http://www.dgzaandam.doopsgezind.nl/ Doopsgezinde Gemeente Zaandam]. 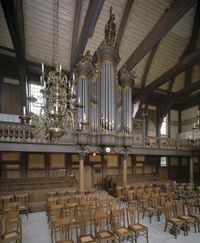 Interior and Organ, Doopsgezinde Kerk, Zaandam. Zaandam, a town (coordinates: 52.44204, 4.82920 [52° 26′ 31″ N, 4° 49′ 45″ E]; pop. ca. 46,000 with 1,302 Mennonites in 1955; 139,774 in 2004) about 6 miles (10 km) north of Amsterdam in the Dutch province of North Holland. The Zaan River divides Zaandam into a West Side and an East Side; until the 19th century the East Side was economically the more important part. Some citizens of Zaandam, e.g., Pieter Claesz (Pieter de Coster), were executed at Amsterdam in 1535. In 1543 there was an Anabaptist congregation at Zaandam, of which Klaas Noome(n) was the preacher. Meetings were then held in the homes of the members. Leenaert Bouwens baptized 40 persons here in 1564; in the following years Lubbert Gerritsz was an elder at Zaandam. Soon after this there were at least three Mennonite congregations at Zaandam: Waterlander, Frisian, and Flemish. Though the history of these groups during the 16th and 17th centuries is in many respects hazy, the following account may serve to clear up the complicated situation. A Waterlander congregation existed at Zaandam from ca. 1578. It was represented at a Waterlander conference held at Amsterdam in 1581. In the 16th-early 17th century the Waterlanders living at Koog aan de Zaan were members of this congregation until 1646, when they organized an independent congregation. The Zaandam Waterlander congregation, sometimes called "Komejanse Mennonieten" or "Komejannen," had a meetinghouse since before 1600, which was replaced in 1656. This meetinghouse was commonly called the North meetinghouse; it was situated on the East Side. The congregation was probably very large in the early 17th century. In 1656 the baptized members numbered 326; they lived on both the East Side and the West Side. About 1655 a second meetinghouse was built on the Dampad on the West Side. In 1675,137 members lived on the West Side and 254 on the East Side. Soon after the (Ia) East Side, or North congregation, and the (Ib) Dampad congregation on the West Side developed into relatively independent churches, though for some time they had a common fund for the relief of their poor, and other connections as late as 1712. The West Side Waterlander congregation (lb) merged in 1687 with the Flemish congregation (IV) to form the United Mennonite Church (VI). This merger came about only after much conflict with the East Side Waterlanders (la). The history of this East Side church is continued under (VIII). At Zaandam there was also a Groningen Old Flemish church, first mentioned in 1673, but probably dating from c1632. It had a meetinghouse on the Molenpad on the East Side. It was very conservative, maintaining old practices like feet washing until ca. 1760. This church, always very small in membership (ca. 40 in 1710), was led by lay preachers. In the 18th century it was commonly called Van Kalkers-volk after its elder Izaak van Kalker, serving 1711-ca. 1756. They often liberally supported the Prussian brethren. In 1774 the 18 remaining members joined the United Mennonite Church (VI). When the Dampad Waterlanders (lb) and the Flemish congregation (IV) merged in 1687, it was resolved to drop the old names and "to forget these signs of former discord." Hence the congregation was called the United Mennonite Church (Vereenigde Doopsgezinde Gemeente). The Dampad and the Stikkelspad meetinghouses were abandoned and a new one built on the West Side. This spacious frame building, still in use, was dedicated on 2 November 1687, by Galenus Abrahamsz of Amsterdam. 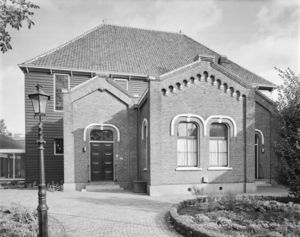 For this new meetinghouse the United congregation is unusually called the Nieuwe Huys congregation. The old Dampad Waterlander meetinghouse was sold as a warehouse; the former Flemish church on Stikkelspad was at first for a few years rented to the Zaandam Lutheran congregation and was then used as a warehouse, and in 1712-1714 remodeled as an orphanage; its fine rooms with old furniture can still be seen (renovated 1933); it was in use as an orphanage only until 1903; in 1959 it was used for church activities. The Nieuwe Huys congregation developed into a strong congregation; at its founding the baptized membership stood at ca. 600, in 1727 it was 763; decreasing to 671 in 1743, 400 in 1777, and only ca. 250 in 1827, and again growing to ca. 320 in 1840. With 150 members of the Oude Huys congregation (II), which in 1841 merged with the Nieuwe Huys, the membership numbered 461 in this year, 483 in 1847, 531 in 1861, 753 in 1900, 770 in 1926, 779 in 1942, 760 in 1949, when this congregation merged with the Zaandam-Oost congregation. Hoop Scheffer, Jacob Gijsbert de. Inventaris der Archiefstukken berustende bij de Vereenigde Doopsgezinde Gemeente to Amsterdam, 2 vols. Amsterdam: Uitgegeven en ten geschenke aangeboden door den Kerkeraad dier Gemeente, 1883-1884: I, Nos. 673, 708, 865, 892; II, Nos. 2364-66; II, 2, Nos. 673-76. Church website: Doopsgezinde Gemeente Zaandam. Zijpp, Nanne van der. "Zaandam (Noord-Holland, Netherlands)." Global Anabaptist Mennonite Encyclopedia Online. 1959. Web. 23 Apr 2019. http://gameo.org/index.php?title=Zaandam_(Noord-Holland,_Netherlands)&oldid=125950. Zijpp, Nanne van der. (1959). Zaandam (Noord-Holland, Netherlands). Global Anabaptist Mennonite Encyclopedia Online. Retrieved 23 April 2019, from http://gameo.org/index.php?title=Zaandam_(Noord-Holland,_Netherlands)&oldid=125950. This page was last modified on 11 October 2014, at 07:37.